T T hough we complain about the wretched humidity, the tense commutes, and the weird dating scene, life in Pitbull’s hometown is kind of amazing. With so many different neighborhoods, each with their own distinct vibes and fashion to match, life in “the 305” can be anything you want it to be. So start wherever you are, whatever time of day, and check out the itineraries below. If nothing else, we can pretty much guarantee there’ll be epic people-watching -- it’s Miami. 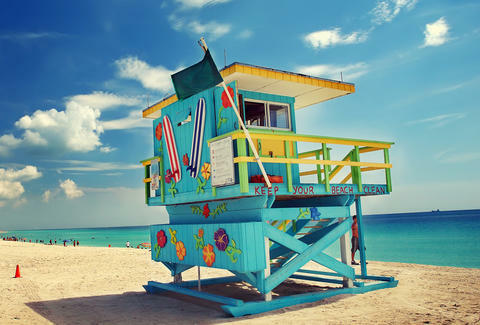 Just short of hell, there is nothing as hot as a Miami beach day -- but do it anyway. Head there early, park in the public lot at 21st and Collins Avenue, between W South Beach and The Setai, and try to get a tan like an actual Miamian. Connected to Miami’s Freehand hostel-turned-hangout, this eclectic American brunch joint has everything you need to keep your strength up in the aforementioned blazing hot sun. Order the Huevos Diablos (fried eggs, tostada, black beans, carnitas, red and green salsa and queso) and pair it with a Green Bloody: tequila with roasted Serrano chilies, French Sorel, green tomatoes and lemon. Happy weekend, indeed. Annnnd we’re back outside! The other good thing about this hostel is its award-winning courtyard bar, Broken Shaker. Once Miami’s best-kept secret, now pretty much everyone knows about it -- and for good reason. If you’re not napping under a banyan tree or in one of its hammocks, you should be grabbing a comfy chair, mingling with the people actually staying in the hostel, and sipping on one of its Instagram-worthy cocktails. The drink menu changes weekly, but there’s always some kind of Old Fashioned with cereal in it (Coco Puffs, anyone?) with our name on it. Order the Not So French Toast. We’ll translate: prosciutto, basil and ricotta sandwiches, on baguettes, that are then dipped in egg and fried. This spot serves breakfast daily but miraculously, is rarely crowded. You can eat this everyday. If there’s anything Homestead is known for, it’s its exotic produce. This tropical fruit stand has been around since 1960 and is definitely the most popular in Miami, so stop off for Florida star fruit, papaya, lychees, pineapples and more. Originally named because someone said it was “hell to get into, hell to get out of,” this canoe trail lets you paddle through mangroves, small ponds, bays, campsites, and everything else that only makes sense in the Everglades. Word to the wise: plan to go one way, or turnaround halfway through -- sailing there and back takes six hours. 2pm: Go to Schnebly Redlands Winery & Brewery Grab some food, drive north, and in the middle of a random giant grass lot, find light-strung tiki huts, a restaurant, flowing waterfalls, and a standalone winery, brewery and store. Grab a seat at one of the long picnic tables, and try some wine and beer made from Homestead’s exotic fruits, like mango, guava, coconut, pumpkin, and our personal favorite, lychee. It’s at the Ritz-Carlton Key Biscayne, yes, but it’s also a relaxed burger joint with b-a-l-l-e-r food that won’t break the bank. Post up in a cabana and order the Dune Classic -- it’s a huge patty, a bacon slab, and potato straws between two buns. Crandon Park has everything from golf courses and tennis courts, to nature trails, mangroves, butterfly gardens, BBQ spots, and yes, kayaking. When you get in the park, head to the North Beach Concession and rent a double kayak for $20 per hour. Then go out on the Atlantic and try not to get lost. When you’re in Miami, it’s pretty much wrong to never be by the water. This iconic Key Biscayne locale is the best spot in the city to watch the sunset, so grab a table outside, and order the most Miami thing ever -- a Cuban Mojito. Kush is the gritty little brother of Coconut Grove’s Lokal. But since it runs in the family, expect similarly epic burgers, local beers on tap, as well as alligator bites, chili hobo Frito pie and pastrami Reubens. Go for lunch and order the Kush & Hash burger -- it’s a burger served on a waffle bun, topped with hash, bacon, fried egg, American cheese, homemade ketchup, and comes with a side of maple syrup. No, we are not making this up. Next, hit the PaniQ Room, a live escape game and Miami’s latest craze. Grab your friends, choose a room (we recommend the Pirates’ Den) and work together, 90’s Clue-style, to crack through encrypted hints and figure out how to get out in under an hour. Good luck. At 3:05 in “the 305,” something chaotic happens where everyone’s eyes get bloodshot, and the air fills with yells of start “CAFECITOOOOO.” That might be an exaggeration, but Miamians know what we’re talking about. When in Wynwood, calm this panic with a cold-brew coffee from Panther Coffee, made with small-batch Nicaraguan beans, roasted in-house. 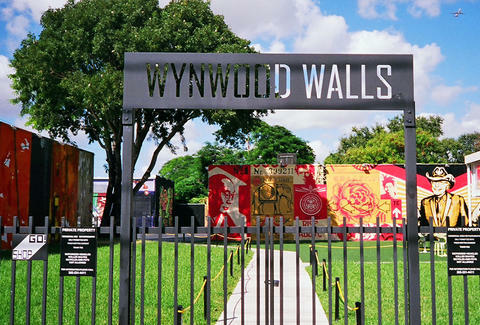 In true Wynwood style, there is art everywhere, so get that fix here too. Order Aspen’s famous truffle fries. We repeat: order Aspen’s famous truffle fries. There’s no missing these six giant warehouses covered in professional graffiti. Book tickets ahead of time, meet at the Walls (look for the iron gate entrance on North Miami Avenue, between 25th and 26th street), and let local artists and “Miami’s Best Graffiti Guide” give you the 4-1-1 behind the cool stuff you’re seeing. When you find the vine-covered gates in the back corner of Midtown’s most popular mall-turned-hangout, congrats: you’ve arrived. Get there at 4pm and spice up your afternoon with a “Spice of Love” cocktail -- a mix of jalapeño, passion fruit, mango and vodka. Brickell is hands-down the best place to go for happy hour, but to make sure you get the best of it, you’ll need to strategize. Brother Jimmy’s starts the earliest, so get there at 4pm for $3 drafts, $4 craft beers, and $5 wells. This is one of the area’s newer (and cooler) pop-up bars, and it fills up fast. Get there right at 5pm, when the “Atypical” happy hour starts, for half-off well drinks. Hit Batch for $5 beer, wine, sangria and cocktails, as well as herb-and-asiago truffle fries, Hong Kong pork tacos, and BLT sliders. The happy hour ends at 8pm, but you can keep ordering the truffle fries until 3am -- and we strongly encourage that you do so. Ah, Monty’s -- a giant tiki bar where Old Florida hippies and hot locals alike can drink fruity rum drinks in perfect harmony. 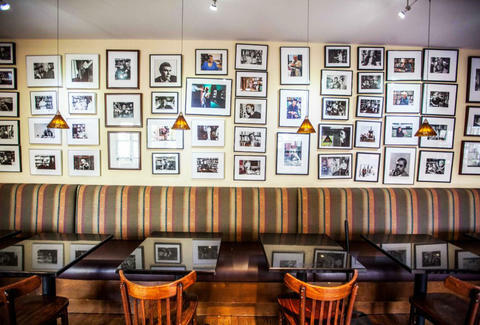 Go there at 4pm, when happy hour starts (it’s the only time you’ll be able to grab a seat). Because you need a Fidy-Fidy burger: it’s 50% Florida ground beef and 50% bacon, with Monterey Jack cheese, Miami Smokers smoked bacon, French AND sweet potato fries, and everything you’ve ever wanted from a burger ever. It’s a dive bar that’s right across the street, and has cheap beer, beer pong tables, darts and a pool table. Calle Ocho has its classy touches, like this wine and tapas bar. When you get there, ask for Laura -- she’s one of the co-owners and knows everything about the millions (well, feels like it) of wines behind the bar. Since you’re on Calle Ocho, walk the three blocks to Exquisito Restaurant and order ropa vieja -- it’s a huge plate of shredded beef, tomato sauce, rice and beans, and sweet plantains. Right down the street is one of Miami’s iconic Spanish bars and lounges, around since 1935. Go for the live music, salsa dancing, regular dancing that the rest of the world knows how to do, people-watching, and some of the best mojitos in Miami. When you walk into this strip mall dive, you expect greasy bar food that you’ll probably regret the next day. Not here. The food team is led by a classically-trained chef who only serves the best -- like Belgian escargot (in a bar? ), frog legs, and nachos with house-made tortilla chips. While you’re there, order the potato chip-encrusted dolphin sandwich. You can thank us later. Located on the second floor of one of Miami’s most popular malls, this swanky bowling alley turns the sport into a party. Plus, at this time of night, it’s just $4 per game and $3 shoes, per person. It’s right across the street, and there’s always live music. You literally don’t know what (or whom) to expect, which is pretty much half the fun.